ThinkHammer: Motorola Droid - First Look. Is it an iPhone Killer or an Outlook Killer? Motorola Droid - First Look. Is it an iPhone Killer or an Outlook Killer? I've been playing with the Motorola Droid for a few days this week and have been impressed with the device. 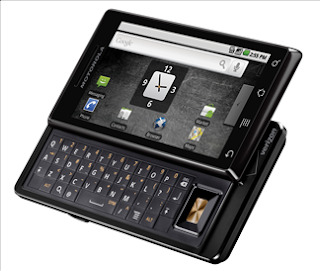 The Droid changes the game because it's a device that's fully integrated with the Googleverse. It's open source and thus open to the largest group of developers. It's on a large, well developed network that's unlikely to leave it's users in the lurch. I think this may be enough to change the game. It certainly leaves me wondering why I'd even bother to load Outlook on a computer anymore. Enough about that, let's talk about the phone. I carried the Droid into the studio and chatted with Eric Rodgers about it.